Cooper City is Located in in Central West Broward County that was founded in 1959. Cooper City is one of the few areas in Broward that we would consider a true Family area. It features multiple sports parks and some of the best public schools there are to offer. Cooper City revolves around the down-home traditionality factor. There is a feeling of neighborhood presence/crime watch and the police make it safe. Cooper City has everything it's residents need and most people will get to know the residents around them. In an ever changing area Cooper City has remained very similar for quite some time now. Many of the homes were built in the 70's and 80's, it is a smaller town within a city and its high school is only minutes away from most spots. Now you do have plenty of smaller new communities popping in Cooper City all of the time. For Example a neighborhood like Monterra was recently completed and is one of the largest Cooper City has to offer. A lot of the older in Cooper City have been well taken care of over the years. The owners of homes in Cooper City Take Real Pride in their homes. Cooper City Has some of the best Public Schools in Broward County. People can pick and choose about which schools in Cooper City are the best but as long as you are in Cooper City the schools will be great. 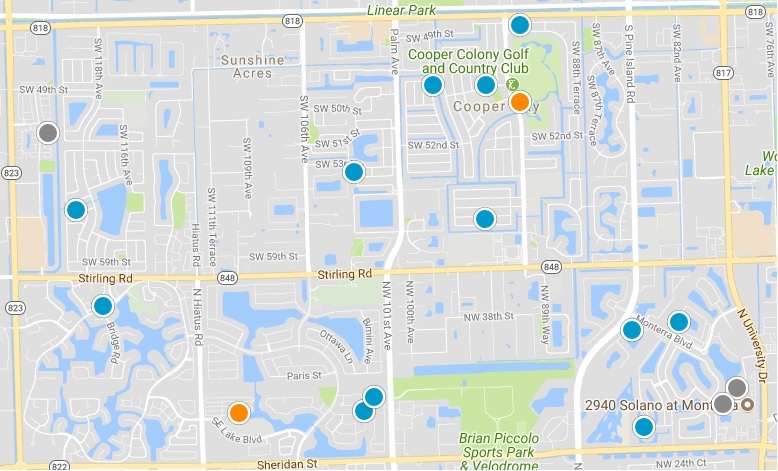 Search Cooper City's interactive map Now !